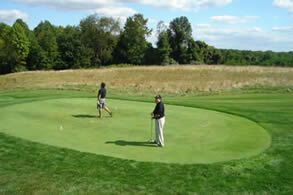 Many tourists frequently travel to Lancaster County, Pennsylvania to experience an unusual trip back in time. 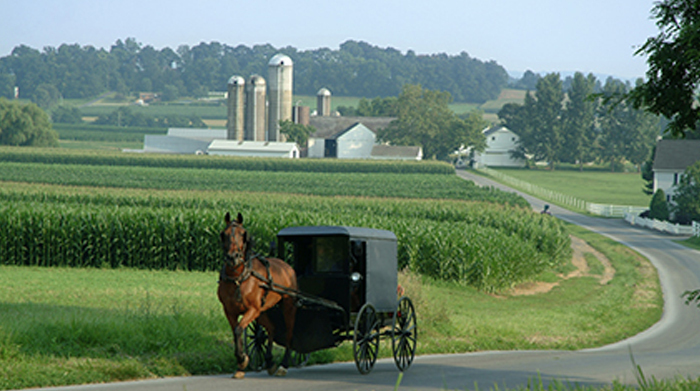 Lancaster County is home to an Amish community of over 80,000 who first immigrated from Southern Germany and Switzerland in the 1720's to avoid religious persecution. The Amish have maintained, to a great extent, their tradition of experiencing life like it was in the 1700's without electricity, TV, internet, tractors, automobiles, etc. When you drive through the rural farmland of the county, you see many horse drawn buggies and plows like it was in prior centuries. With the exception of the asphalt road surface, it’s truly like taking a trip back to the 1700's. Third Generation Family Business Updates to Maintain Their Competitive Edge. Nick Tepavchevich and his wife Gloria were not just partners in life but in 1949 they decided to take a big step and become partners in business. Nick saw the opportunity to start his own business in 1949 making handrails for homes. World War II was over, families were exploding with the returning GI's so it was a great time to address the expanding housing markets need for handrails. When they started Nick did all the fabrication and Gloria took care of the painting. 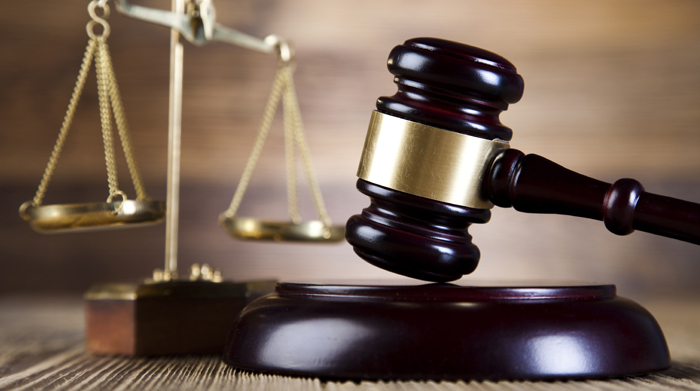 On September 30, 2016, the Court granted in part Ficep's motion for summary judgment, finding no genuine dispute that use of Voortman's machines by at least two of its customers infringes Ficep's patent (U.S. Patent No. 7,974,719). 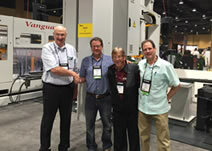 GMF of Lakeland: Florida Scribes Their Way to Increased Productivity and Profit! In 1982 Larry Norman founded GMF as he reached out with a partner and a single welding machine to find work fabricating steel. Interested in securing work, he visited an amusement park about 100 miles away to see if he could bid on some steel fabrication. The buyer at that time questioned Larry if he really had a business as Larry did not even have a business card. Larry was quick to solve that problem and returned with a freshly minted business card so he could bid on some pending work and ended up leaving that day with a contract worth $1,000,000. Obviously, this was the sign that Larry's new venture was the right idea and the timing was perfect. As Larry's background was in the area of machining, he quickly broadened the focus of the business to also include contract machining. 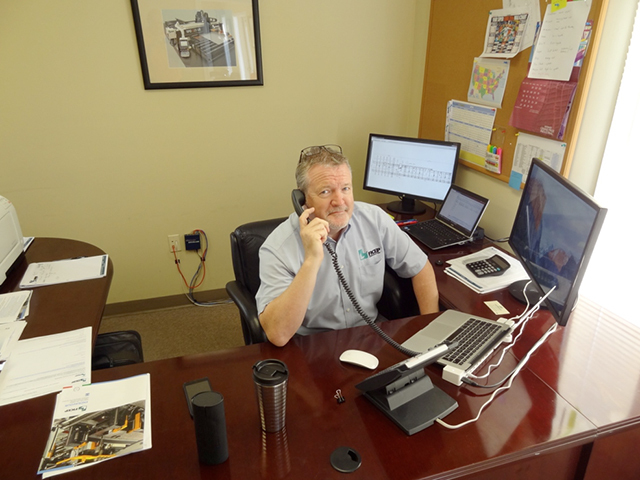 You don't have to travel and visit structural steel fabricators throughout North America very long before you find out that most are first or possibly second generation firms. This is no surprise as typically the start of these firms are centered on a strong aggressive personality with a "can do" attitude that becomes the heart and soul of the business. Firms with this type of origin face a difficult challenge to remove that personality years later and still maintain the same focus on the business. This is the same reason that many firms of this type find it difficult to be acquired, as the removal of this strong founding personality frequently leaves a void in the firm. Because of this dynamic, firms of this type typically go away and are replaced by new firms with a founder that encompasses the same type of strong personality that is needed in this industry to be successful. 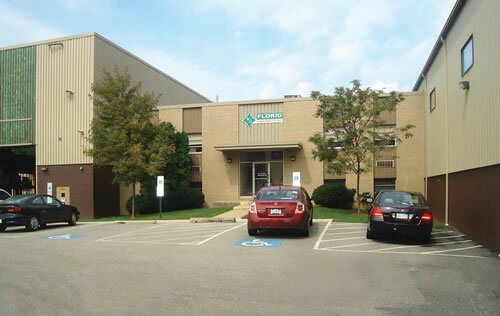 Start-Up St Louis Firm Creates 31 New Jobs and Continues to Grow! 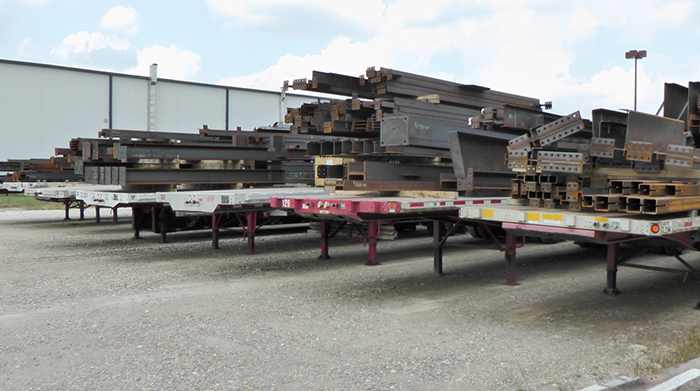 In 2014 Wilson's Structural Steel opened their doors for business in Fenton, Missouri to fabricate structural steel principally for commercial buildings in the St Louis area and the surrounding Midwest region. As Ficep Corporation continues to exhibit unprecedented growth, Tom Boyer, President of Ficep Corporation is pleased to announce the hiring of two key employees who worked previously for the parent company, Ficep S.p.A.
Ficep used the recent Lamiera Trade Show to introduce their latest addition to the most comprehensive product line for plate processing available in the market today. 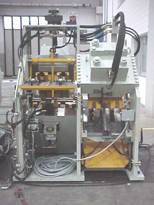 Ficep offers both gantry and pull through style of plate processing systems to address the wide range of applications which is generally dictated by finished parts sizes and thickness. The new Klein Steel facility incorporates the full automation of shot blasting, sawing, and quality control checking into one hands free automated system. 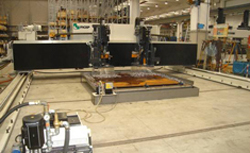 Ficep has always not only been the technology pioneer but has also extended to the market the most comprehensive product line for the fabrication of angles. The most recent addition to the product range is the "XP" Series of angle lines which achieve a material positioning speed of 328 feet per minute but this is only part of the advantage. The internal material clamping is achieved with roller clamps that stay engaged not only during punching for example but also for material positioning to eliminate any clamping and unclamping function for each operation. Fabricators from throughout North American as well as from overseas were quickly blown away by the level of technology that Ficep was exhibiting at this year's NASCC in Orlando, Florida. Expanded level of technology is taking the market by storm! Justin Linkowich Joins Ficep Corporation as Field Service Manager. 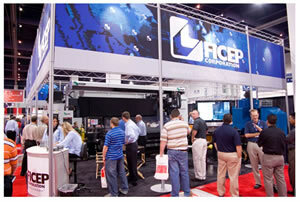 This year Ficep Corporation will utilize the FabTech show in Chicago (Booth S-3942) November 9-12, 2015. 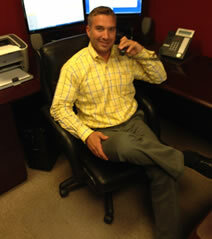 Tim McFadden is our new Regional Sales Manager. 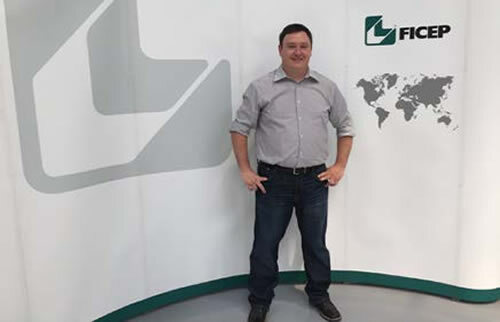 Tim resides in the Dallas area and will be working closely with Capital Machine Technologies in the states of Texas, Louisiana, Oklahoma and with Ficep's Sales Manager Peter Janes in New Mexico. 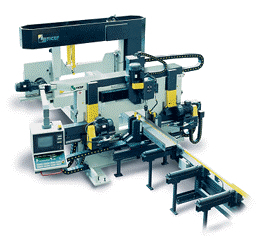 The major trend in the machine tool industry has been for the past 30 plus years to increase the capability of the machine tool to provide a "production cell" which features multiple capabilities. 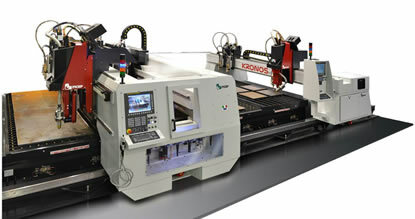 The Duel Spindle Gemini Provides over 40% increase In Productivity! The new Excalibur 12 - the benchmark for CNC single spindle drilling lines, now with automatic tool changer and a sub axis for scribing, slotting and milling. 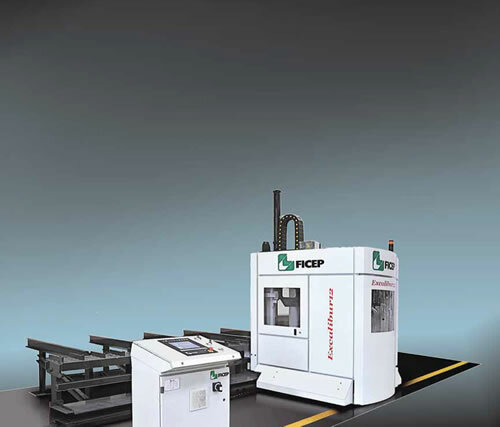 The new FICEP Excalibur is the first single spindle gantry drilling line to process beams for the steel construction and fabrication industries using a sub axis for scribing and milling and it also features a tool changer. Considering last year's election season, how many times did we hear the expression that "Small business is the backbone of our economy"? 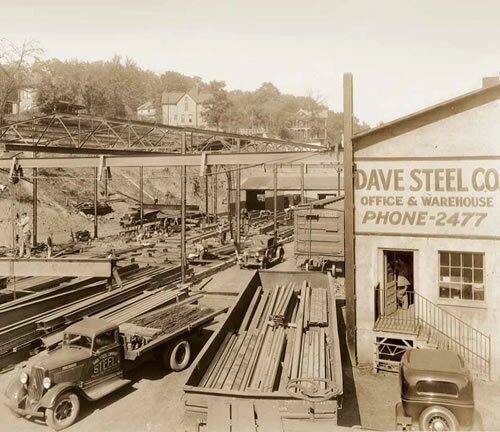 Dave Steel Company Inc., who have been serving the steel construction industry since 1929, has selected FICEP CNC machines for this country's first unique fully automated steel shapes processing system at their new Chesnee, South Carolina Production Facility. 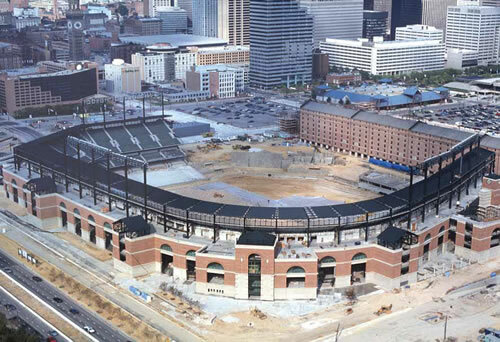 What's the link between - Structural Steel's Life Cycle, Baltimore's Camden Yards, Hall of Fame third baseman Cal Ripken and FICEP Corporation? As structural steel automation technology is already synonymous with FICEP Corporation, the link to structural steel's life cycle and perhaps the structural steel in Camden Yards is logical but where does Cal Ripken enter the story? 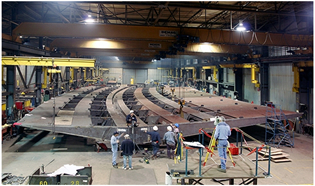 Setting the new Standard in Structural Steel Fabrication Throughout North America! 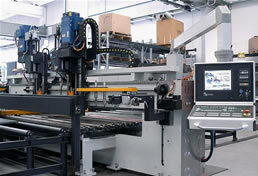 Over the years we have witnessed that many fabricators have grown their fabrication facility and corresponding material handling system to give them the type of fabrication and handling options that is believed to increase productivity. 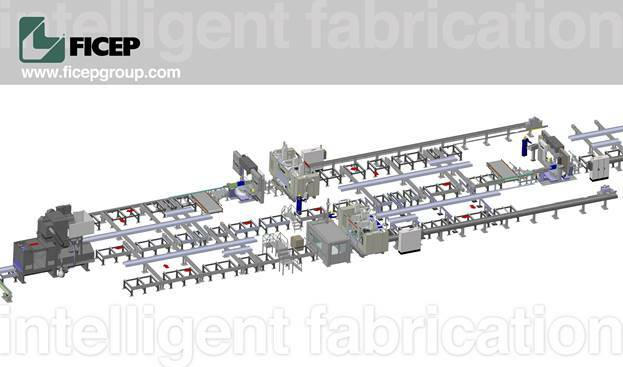 Intelligent fabrication by FICEP blows away the old myths that they need an expansive material handling system with numerous handling options to achieve a leg up on their competition. 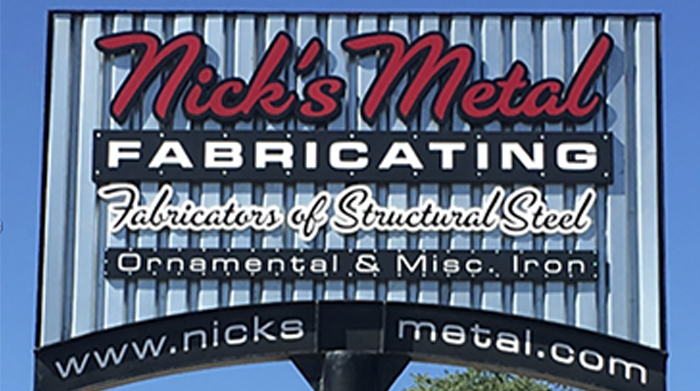 It is hard to find a steel fabricator in North America today where the company's history did not start with the founder having already an experienced foot in the industry. As business accelerates across North America, we are expanding our presence to offer our technical support in a new time zone (Pacific Standard Time) and in both Spanish and French. Ficep Corporation is pleased to announce the expansion of its regional service offices with the opening of Tech Support Offices in Montreal and Southern California. 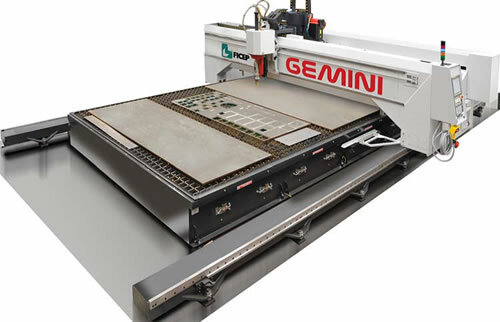 Ficep has once again broadened its product line of plate fabrication systems that it offers to the market understanding that two or three models do not address all the individual needs of fabricators in the world market. 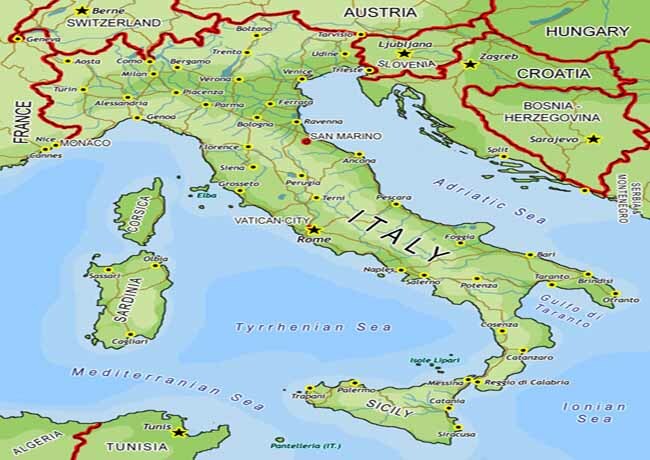 Even though 2009 was thought to be a global recession, Italian Machine Tool Manufacturers in the metal forming category (bending, forming, punching, shearing, cutting, drilling, etc.) managed to grow their sales over the figures of 2008 which was generally thought to be the best year in recent history. 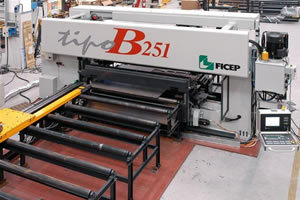 Ficep has traditionally offered fabricators and manufacturers the most expansive product line of CNC angle lines (channels with web and flange holes and flats can also be processed) that incorporates the operations of: Punching, Drilling, Marking, Notching and Shearing. The Tipo G Series of Plate Processing Systems address the needs of such industries as bridge/structural steel fabricators and manufacturing firms producing large plate components such as tube sheets. 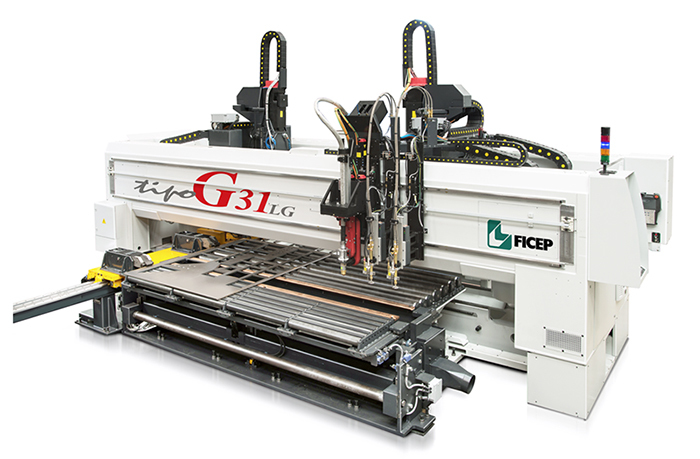 The Type A 31 is equipped with two independent spindles that can be programmed in unison or independently in the y axis to permit the engagement of both spindles in the material simultaneously to maximize the efficiency of the system. 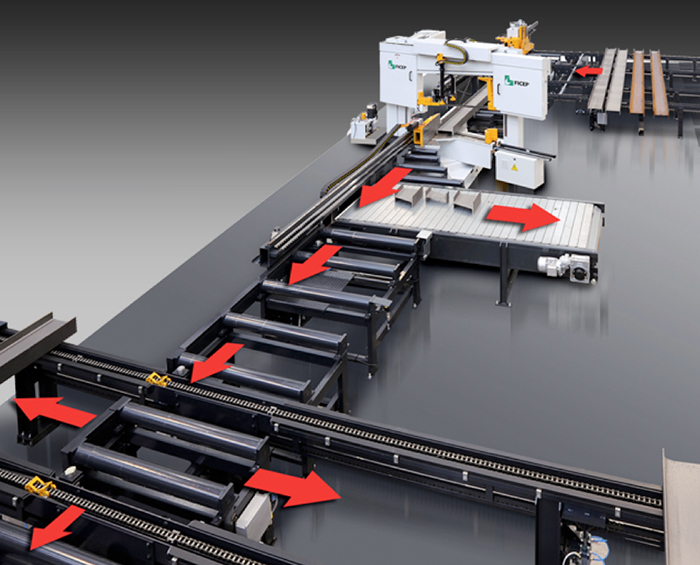 At Last A CNC Angle Line that has the Versatility of an Ironworker! Ficep has a long tradition of expanding the capabilities of their CNC angle lines that gives their users unparalleled capabilities such as punching, drilling, marking, notching and shearing. The typical argument against having a drill and saw in tandem (side by side layout) has always been that if the drill is working, the saw is idle and vice versa. Even with this objection, the tandem approach has proven to be the ideal solution for many fabricators as the reduction in required plant space, the need for only one operator and the lower investment cost has proven to be the optimum solution for many facilities. 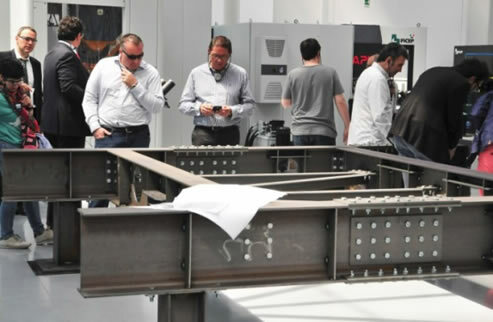 In October of 2010 several fabricators took the opportunity to make the trip to Milan to view several structural steel fabricating facilities. The group was totally impressed by the level of automation, organization and productivity of these plant facilities. Fabricators from around the globe were TOTALLY AMAZED at the productive drill feed rates of 50 inches per minute that Ficep was demonstrating at the recent show in Chicago. There was lots to see at FabTech 2009, but this was no trick as this single tool had drilled hundreds of holes dry without replacement by the end of the show. 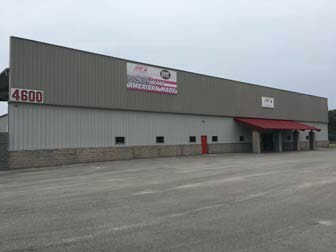 ADF Group Inc. of Terrebonne, Quebec (Montreal area) is presently updating their CNC technology with the installation of comprehensive plate and structural steel fabrication lines from Ficep Corporation, Forest Hill, Maryland. September 18th-19th Ficep Corporation of Forest Hill, Maryland conducted their annual sales meeting for their distributor network in North America. Distributors came from as far west as California, Oregon and Washington. 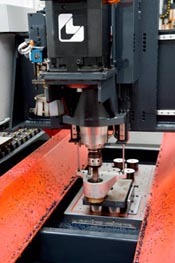 Having Trouble Determining If You Need A Plate Drill Or Plate Punch With Burning Capability? 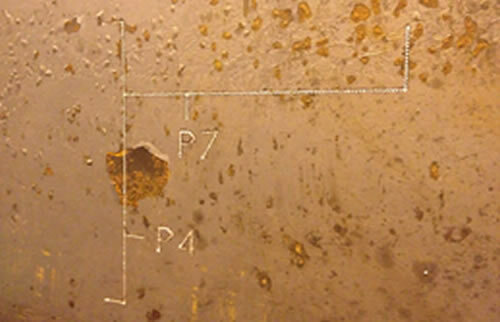 This question is a dilemma that has confronted many fabricators over the years as they like the speed of punching but find it difficult to invest in a CNC plate processing center only to have to drill the thicker plates ..
Are You Producing High Tolerance Plate Parts That Will Ultimately Require Some Machining?